On 6th June 1944 the Allies landed in Normandy. This famous day is commonly known as D-Day. In 2014, the 70th anniversary of this day, which was so crucial to the outcome of the war, will be celebrated. 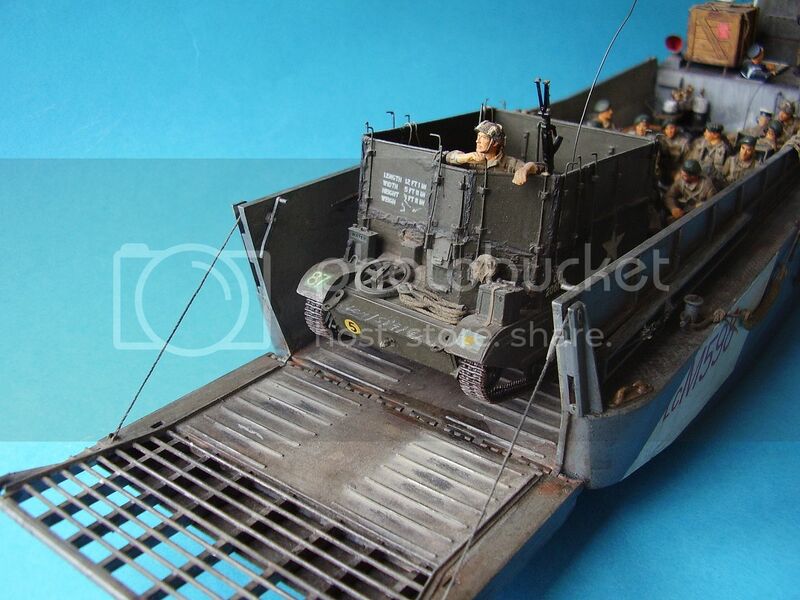 From 1942 in the Second World War, a good 8,000 of the LCM 3 (50ft Landing Craft) were used by the American and Royal Navy to transport light armoured cars and materials from ship to shore. These Landing Craft could carry up to 30 tonnes of cargo and were used for landing the Allied Forces in Normandy (D-Day). With a total build of at least 640,000, the 4x4 off road vehicle is the vehicle most used in warfare. This robust, light and all-wheel drive vehicle was used by the Allied Force in all theatres of war. This vehicle was often brought ashore from landing craft to the coastal areas taken by the troops for supply and transport purposes. My first thoughts when this arrived were ‘that is a big box for a 1/35th scale armour model’, once you open the box you understand why it’s so big. The moulding that stands out is the hull, and this is a very solid and rigid moulding that takes up a significant amount of space in the box. The parts for the LCM 3 are packaged a four clear plastic bags with the 4x4 vehicle parts in a fifth. The LCM 3 parts are very cleanly moulded with no excessive flash to speak of, the inside of the armoured pilot house does have some small and very shallow ejection pin marks that will need to be addressed, there are also a number of ejector pin marks on the top outer face of the inner hull and this problem also effects the framing that is attached to this area; I found perfect plastic putty a great product to tackle this issue.. The 4x4 vehicle, let’s call it a jeep, is in reasonable shape despite its age with no issues other than some flash that will need cleaning up. This model is supplied to represent either a Royal Navy or U.S. Navy craft and there are some subtle differences that you will need to decide on when deciding which one to build. One thing that is disappointing is the gates between the sprues and the parts which in a number of cases are on the heavy sides making parts removal more difficult than needed. The underside of this beach basher requires very little in the way of work. There is an injection tab left that has not been fully removed; however a little sanding should take care of that. The propellers, prop shafts, support frames and rudders look to be straight forward additions. The LCM 3 is supplied with to support stands for display purposes, however you may have your own ideas about how you want your finished model on show. There are some holes that would look better opened up such as where the bilge is pumped out. The loading deck and sides looks a good match for the pictures I was able to find online. The upper outer face of the loading deck walls do have some ejection pin marks that will need to be filled and cleaned up. Included with the model is some very nice detail for these areas such as the cargo mooring points and the boat hooks included in the kit. I do question what I believe are the access panels to the bilge in the loading deck as they are two different sizes and there also appears to be more of them than shown in my limited reference and images online. The access panels on the deck are matched by those on the inner side panels, my reference shows four being present on each side and the kit has three, I will not say it is wrong as I believe these were mass produced by a number of factories and so changes I believe would occur. The bar grips on the deck do look to be very good and should allow some nice variation in colour when painted. The main deck has a very nicely replicated diamond tread pattern replicated. The engine vents look ok and will I suspect be perfectly acceptable to most, but these can be further improved with a little sanding to reduce the plastics thickness. The bollards for mooring the LCM are also nicely done even though they are a fairly simple detail. The access hatch for the engine is supplied with the option of it being open or closed, however unless you are going to do a lot of scratch work in the area the only real option is to have it closed. The pilot house is a pretty basic structure by design however the detail that is there matches the images I have seen of this area. The helm such as it is consists of a control panel supply in the form of a decal in this kit, a left and right throttle and the good old steering wheel. I cannot speak for the accuracy as I could not find reference for the interior of the pilot house. Realistically by the time you get to the pilot house the LCM is finished depending on the finish you have opted for. In the belief that most will go for the U.S. Navy version, there are two 50cal machine guns with mounts; the machine guns are reasonable but will be lifted significantly via the addition of turned metal barrels from a company such as RB Model. The loading ramp is supplied with the option of being shown either up or down but is not workable. There are three Navy crew supplied with the kit and I have to say I am very impressed with them. You are supplied with 2 crew to main the 50cal machine guns and a pilot for the craft. The crew are basic as far as assembly goes with just the arms, the head and the helmet being required to add to the main portion of the figure. The clothing is quite bulky with very nice crease detail and really does look the part. The hand and facial detail is very good, surprisingly good in fact. There are moulding seams that will need to be cleaned up but nothing out of the norm. Also included are rope buffers, a tyre and fuel barrels. The fuel barrels are not the latest offerings in terms of detail but they are acceptable, you of course can opt to use or not or even replace them. The rope and tyre bumpers are acceptable with very nice detail on the rope bumpers, however rope buffers are hollow on the reverse face which is a little disappointing. The Jeep in this kit did get some flak when news of this release was announced, and I have to say that the image released did not really show it in a good light. The model is pretty basic but on the whole is reasonable; there is even a separate engine included in the model and the choice of a deployed or folded canvas hood. I accept that the model is not up to current standards but it is acceptable. Included with the Jeep is a trailer which is a nice addition which if not used in conjunction with the Jeep or even the LCM it will find a use somewhere. There is fair detail on the interior and exterior of the trailer, the weakness for me is the tyres which could be better detailed read wise. 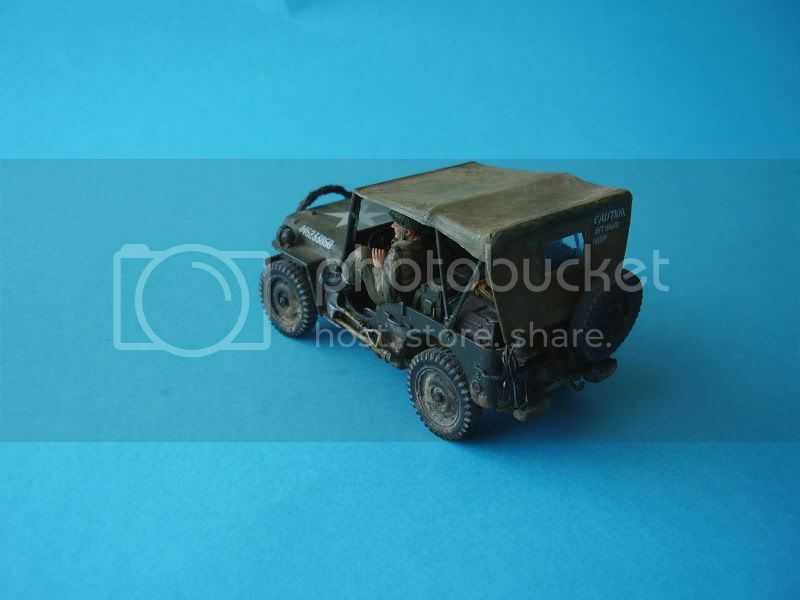 Included for use with the Jeeps are three figures; a driver, a rifleman and another firing an anti-tank weapon. I have to be honest these figures are poor in both terms of detail and dimensions, I suspect these figures date back to the 1970’s and in this case should have stayed there. The helmet, knife, canteen and M1 rifle are the only parts that I feel are useable but there is quite a bit of flash present on these parts. Do not confuse my opinion on these figures with the LCM 3 crew figures which are very good. The instruction is a lose leafed booklet that uses black and white line drawings to guide you through assembly, the layout is well considered and follows a logical progression. The decal sheet is very good with good colour and very fine decals in terms of thickness. I do question the inclusion of a 2 star generals ID as it seems very odd for a vehicle coming off of an LCM 3 during the middle of a battle. The LCM 3 kit and its related figures are very good and well worth picking up when you see it. The Jeep is not brilliant but is fair considering its age and not a bad inclusion as part of the set. The infantry figures are very poor in the set but that should not deter you from picking up a model that is an impressive size and eye catching size. Highs: A decent sized and accurate model with a good number of options and display possibilities. Lows: The infantry figures are not up to the standards of the rest of the contents. Verdict: A model well worth your consideration. Love to see this one built, looks like a decent kit (the LCM), with a little scratch building and some AM parts, could be a real nice model. The 2 pictures at the end of the review are where I stuck some parts together and the join is exceptionally good. Alan I believe you are correct and there is no ladder. Kev I am working my way through it. Yep, this is the Italeri kit #6479 which is the LCM kit and new figures combined with the old 70's era Jeep and US figures. Hee hee; I know they are recycling the figures with the jeep but the bazookaman is a funny one inside the LCM - I suspect that if the swabbies thought he was about to zap them with backblast they'd open the ramp out to sea! The thing is Fred rather than it looking like a bazooka it looks more like a recoilless rifle that is normally mounted on a light vehicle.